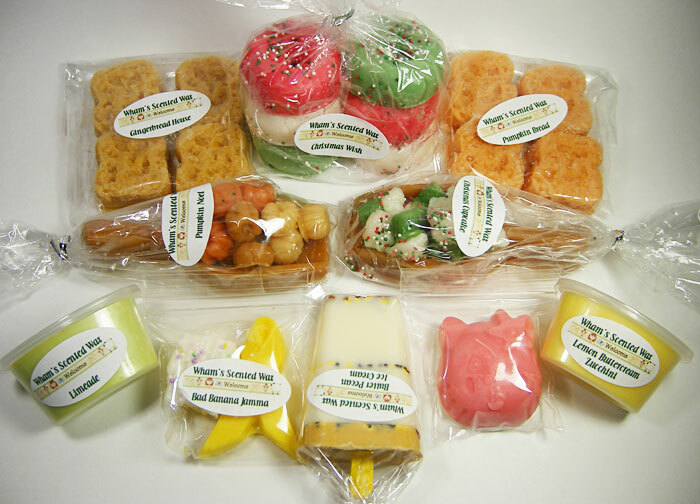 This is my second order with Wahm's Scented Wax and I absolutely love everything that Julie makes. From how it looks, to how it smells on cold throw and while melting. She is top notch and has made her way to the top of my list for tart makers. I am already plotting a third order. Julie is very communicative, fast, and friendly. She's simply amazing, I don't think the gal ever sleeps! Read on for my scent review! Christmas Wish - A wonderful Christmas treat. A unique blend of hints of lemon, orange, cedar wood and pine all nestled in a warm, rich vanilla cookie base. It reminds me of a kitchen filled with freshly baked sugar cookies surrounded by pine and pine cones scented in a fireplace. --Yummy creamy pumpkin, I don't smell any cinnamon at all which is awesome! This scent was done in the scoop w/pumpkins and the whole thing is meltable! --A very yummy sweet lemon buttercream frosting piled high on top of soft zucchini bread. A nice cozy scent! --This smells just like the pumpkin bread my grandmother used to bake! So comforting and warm smelling, this is strong! gingerbread house (toast 4 pack)- Candied Citrus, Pink Sugar, Ginger Root, Brown Sugar, Molasses, Buttercream Frosting, Allspice, Golden Caramel, Vanilla Sugar. --a fresh baked gingerbread house decorated with candies, non-perils, frosting, sparkling sugars and spicy gumdrops! of the oven and covered in icing and decorated with your favorite Christmas scene. --This one is the scoop, I asked her to surprise me with the shape and she made cupcakes by hand without a mold! I think she did a wonderful job with them. Reminiscent of vanilla bean noel with a dollop of buttercream frosting. yummy! --Definitely fizzy smelling and very limey! Jas and I both love this one, its going to be a strong melter! --Hello Kitty shaped layered in white and pink. The sweetest sugarard strawberries sitting atop a buttery shortcake round. I can't stop sniffing this! --Popsicle shaped. I got this as a freebie in my first order too! Love it! Bad Banana Jamma - Wahm didn't have a description, so I found this on the supplier's webpage: We combined Banana, pineapple, strawberry, cherry, coconut, vanilla custard, caramel, almond toffee crunch, chocolate fudge and french vanilla. Then we topped it all off with a super rich and lusciuos whipped cream. --Straight up sweet, ripe banana, and perhaps a touch of rum. No basey/caramelly/taffy scents in this at all! I would have never thought by the blend decription that this would smell like a real banana! Amazing what certain blended scents can do! WAHM's is just awesome. Julie is so sweet, and I have gotten big throws from her tarts. Love the shapes too!